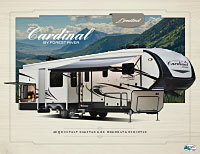 Cardinal Limited Edition is rising back into the fifth wheel market. Enjoy many of the features you know and love with your favorite Cardinal products! Residential furniture, superior vacuum bonded, 100” wide construction and amenities that you cannot live without!